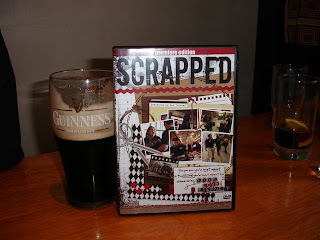 I got some pictures from a woman in Ireland who watched Scrapped with her scrapbooking group. I asked if she could send pictures of the movie with something uniquely Irish for the blog so I got the jackpot. Scrapped at Ladies View Killarney, Scrapped at the Toric Waterfall and of course... Scrapped with a Pint. The pictures are so beautiful that now I wish there wasn't that stinkin' DVD case in the way. OMGosh, these pictures are HILARIOUS!!! Hey, not only have your layouts been published... they've made it to some of the coolest places on earth. You have pictures to prove it. I've actually gotten pictures from people of their Scrapped DVD in Japan, Sweden and Italy but they were pretty much the DVD next to something non descript like a concrete sidewalk, a bush or in someone's living room. Not that that's not appealing... it just doesn't prove the disks have made it to 4 of the 7 continents. So far I don't know of any Scrapped disks in South America, Africa or Antarctica... If anybody could use some scrapbooking time, it would probably be someone holed up in Antarctica. Oh how cool, twas me took the photos of your DVD after my friend Nina who lives in the States sent it to me. So cool that the pics made it on the blog!